Tag Archive | "Yolanda Holder"
Yolanda’s first full marathon was the Portland Marathon in 1998. She chose the race because it was walker-friendly. In 1999, she completed several additional marathons and numerous 5k, 10k and half-marathons. To commemorate her 50th birthday, Yolanda wanted to complete 50 marathons. That year she not only reached her goal, but surpassed it. She finished 65 marathons in 52 weeks. 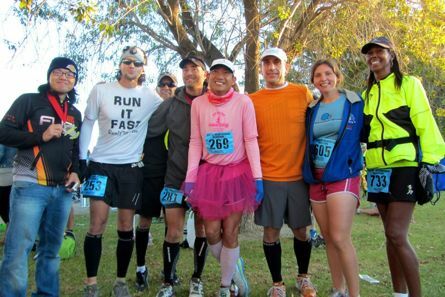 In 2009, Yolanda finished 77 marathons. At the end of that year, she researched Guinness Book of World Records to see what the record was for “Most Mileage Daily for 365 Days.” She learned the record was 100 marathons set in 2002 by an Italian. Yolanda decided to set out to break that record. On September 2, 2013, Yolanda’s mother passed away of complications related to diabetes. She had already lost her father from the same disease. In honor of her mom, Yolanda was inspired to create an Extreme Walk 4 Diabetes. During that year, she walked 521 Miles in 15 days from Corona to Oakland and raised funds for American Diabetes Association. Promoting the benefits of walking 30 minutes a day is very important to Yolanda. “I’m passionate about walking for health and hope to continue to inspire and motivate people of all ages to get out and get fit by doing whatever physical activity they chose,” she says. Yolanda states the benefits of those 30 minutes of physical activity includes lowering cholesterol, decreasing the chances of heart disease, and fighting obesity. Yolanda has a distinctive competitive style. She does not wear “walking” shoes. Her favorite brand of shoes is Skechers. She always wears skirts. She was racing in tennis skirts before running skirts became popular. Running skirts have many features, including pockets for gel packs and a music player, as well as compression shorts underneath. She always wears a hat. Different styles are worn by this diva, including caps and fedoras. In addition, she always sports hoop earrings and designer sunglasses.”I wear shades because I am cool like that! Who says you can’t look good while you exercise?” she asks. Yolanda uses several techniques for mentally preparing for marathons and ultra marathons. She meditates about reaching the finish line and encourages herself by saying positive statements like, “I will do my best and I will have conquered all those miles when I am done.” At mile 23, when she is tired and enduring the pain of blisters, she convinces herself that she is having fun and she smiles. Visualizing the finish line and the medal around her neck also provides a great deal of encouragement. Yolanda laughs as she tells of one of the pep songs she sometimes sings in her head during a race. “Don’t you wish your girlfriend was hot like me? Don’t you wish your girlfriend was a marathoner like me?” She states that participating in long races are very spiritual experiences. “Talking to God for six hours gives you a lot of time to come up with multiple solutions to your problems” she shares. By the time Yolanda reaches the finish line, most of the other runners have already finished and there are only a few watchers left. When she hears those people cheering, she knows it’s for her. She has been married to her husband for 31 years and is mother of two grown children. Her children share her drive to succeed. Son R.J. is a double major college graduate and daughter Tiffany is a missionary She has traveled all over the US to compete. As a member of Marathon Maniacs and the Legends of 100, Yolanda has competed at various races, including the New York and Boston Marathons. Some of her latest accomplishments include competing in Anchorage, Alaska at the Six Days at the Dome, where she placed in the top three women and eleventh overall by power walking 400 miles. Yolanda also completed 311 miles in 10 days in the Extreme Walk 4 Diabetes Death Challenge from Corona to Las Vegas to raise money for the American Diabetes Association. 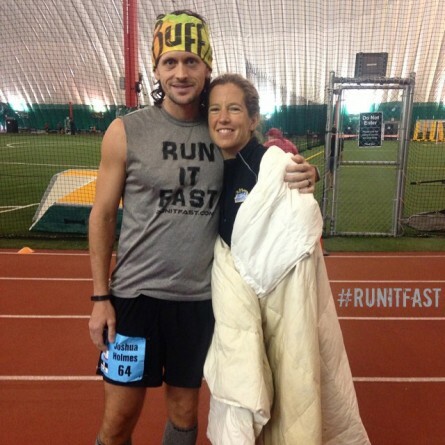 Yolanda has completed 485 marathons in the last six years. By the end of this year, she wants to pass another milestone: finish 500 lifetime marathons. 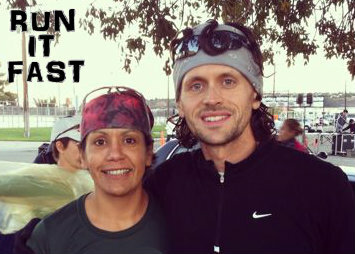 Yolanda was honored to be chosen as one of the core team runners for the Race Across the USA event. 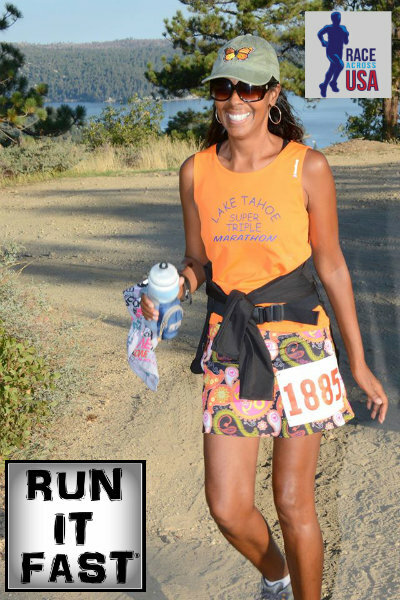 She shares the race’s goals of raising awareness about childhood fitness as the run from coast-to-coast, beginning in January 2015. Even though she has been previously traveled to all 12 states that the race is passing through, she is looking forward to the whole journey which includes camping. She anticipates the opportunity to show how walking can improve overall health. Showing others how fitness can be fun is definitely one of her top priorities. “You never know where walking will lead you, said Yolanda” There is a lot of truth in that statement. Just look at the Walking Diva. You can learn more about the Race Across the USA at http://raceacrossusa.org. It was an opportunity I couldn’t pass up nor wanted to miss. 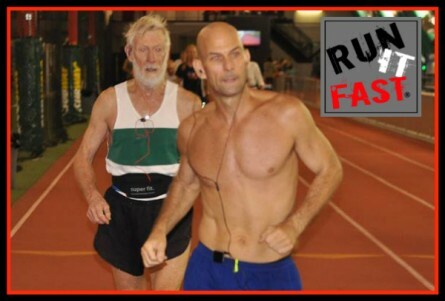 A chance to run the 48-Hour race at Six Days in the Dome with some of the all-time legends of ultra running. When Joe Fejes first told me about the race, the venue, and how he as going to try to break Stu Mittleton’s 6-Day record I knew I had to be there. I knew it would start 12 days after I had run the Badwater 135. I knew I wouldn’t be my best, fresh, or perhaps even able to run it. I didn’t even buy my plane ticket until 6 days before the race. I also didn’t run a single step between my Badwater finish on July 22nd and the start of the Six Days in the Dome on August 4th. I arrived in Anchorage around 3pm on Sunday, the third. I took a taxi to The Dome and arrived about 15 minutes later. I took a quick self-tour of the dome and didn’t see anyone else associated with the race. I then spent a few minutes on my phone trying to figure out where the pre-race mixer was taking place and to see if I had in fact packed a Toga (OK, that last part isn’t exactly true). I found an email on my phone that the mixer was at Humpy’s. So I called the taxi company and arranged for a ride from The Dome to Humpy’s. I get to Humpy’s and can’t find Joe, other runners, or anyone else associated with the race so I walked out. Down $40 in cab fares to this point, and strapped down with my 50-pound backpack, I decided to walk the 3 miles to Wal-Mart to get stuff for the race instead of ponying up for another taxi. I probably should have called for a taxi but my frugality got the better of me. That was one very long three mile walk, with that heavy backpack on, in minimalist shoes, while the brisk Alaskan sun cooked me so slightly. I was smart enough to get a taxi back to The Dome after buying a good bit of junk at Sam Walton’s. The Dome was a brisk with activity when I arrived back at it Sunday evening with my haul from Wal-Mart. I got my stuff settled at my race side table for the race and quickly made my pallet in a half dim room and relatively quickly, for me, found sleep. The start of Six Days in the Dome was delayed 2 hours for timing issues. In retrospect, many of the 6-Dayers would say that was a sign of things to come. Everyone was ready to go at 9am and we got word that it would be delayed 1 hour until 10am and then that it would be delayed another hour until 11am. I had just taken a Gu Roctane and been through my pre-race rituals when news of the first delay got to me. Don’t let that sound like more than it is…I have very few pre-race rituals. But with a race delay, it’s beyond your control, and there is nothing you can do about it. So you wait along with everyone else. It affects everyone the same by and large. Finally at 11am local time the race started. Most everyone probably started faster than they wanted to because of the pent up energy from being delayed for a couple of hours. I was pretty fast the first 40 laps on the 413 meter track but not nearly as fast as Zach Bitter who was there for one thing – to set the World Record for the fastest 100 miler. I was lapping nearly everyone on the track at some point during that time, but Zach was lapping me what seemed like every 10 minutes or less. He was blazing fast, running like you’d see someone trying to put down a fast mile on a high school track. It would be easy to compare him to a gazelle or cheetah but in comparison to Zach any normally fluid animal’s form would be considered ragged and inferior. And all the while he did it with a smile on his face, while we encouraged each other, and while he was gracious with every other runner on the track including going wide into lane 6 on several laps to high five dozens of elementary kids who were in The Dome for day camp that were cheering us all on. He was ultra smooth with the emphasis on smooth. I ran really well for the first 15-20 miles. Through 20 miles I was right on pace to replicate my 100 mile PR time of 18:49 that I set at Across the Years back in late December. However, my right ankle and feet were starting to bother me just 10 miles into the race. I thought it might be the shoes I was wearing (Hoka One One Conquest). So after 10 miles I changed into the Hoka One One Bondi B. The change helped very briefly before the pain and discomfort grew to a point that I knew a new 100-mile PR was not going to happen. The surface was harder than any other track I had run on before. I wasn’t the only runner to notice this early on in the race. Many complained about it as the race unfolded. I believe the hard surface along with the residual bruising, beating, and wear and tear from Badwater just 12 days before were likely the culprit for my feet and ankle feeling like they had been beaten over and over with an aluminum baseball bat. And with that the entire race changed for me. I could have stopped at that point. There is no DNF after finishing 1 loop at a timed event. But I didn’t travel all the way to Alaska to run just 25 miles. For better or dumb I still wanted to knock off another 100 miler. I walked as fast as I could and did so for most of the next 60 miles. The pain was still fluent, but it wasn’t as bad as it was when I would run. The bright side of walking for many hours on end was that I got to meet and talk with some of the pioneers and all-time legends of ultra running. Those slow painful miles of walking were distracted by great conversations with Bill Schultz, Yolanda Holder, Marylou Corina, Joel Gat, Frank Bozanich, Josh Irvan, Andy Noise, Ken Rubeli, Bob Davidson, K-G Nystrom, Martin Fryer, Ed Ettinghausen, Lazarus Lake, Gregg Ellis, Brandon Wood, Francesca Carmichael, David Johnston’s son, Mark Mccaslin, Steve & Terri ‘Theresa’ Durbin and many others. After about 15 hours of race time I took a shower and went down for a nice 3 hour nap in my sleeping bag. The rest and time off my feet helped a bit. I hit 24 hours with a paltry 71 miles. After about 80 miles I started to feel a bit better. 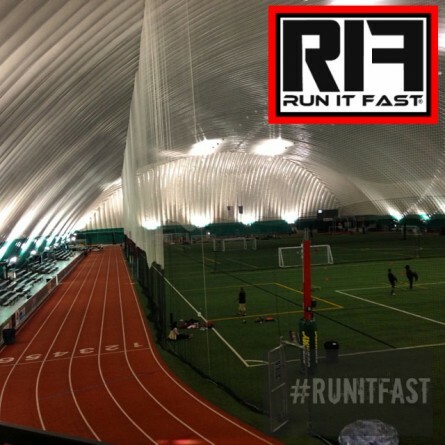 The Dome had a gym full of weights right next to the track. So I’d lay down on the bench press, elevate my feet, and do a set of 40 reps just with the weight of the bar. This seemed to be a great magic trick to my body. I was able to run at a pretty good pace for several laps in a row after my chest pump. I believe elevating my feet, while sending the rush of warm blood to my chest, away from my legs and feet was a nice shot of adrenaline and redirect of the discomfort. I did this 3-4 more times over the course of that second afternoon and it helped each time. I finally hit 100 miles in a Personal Worst of 33 hours and 45 minutes. I sat down and took a couple of small breaks before hitting 100 miles in an attempt to put my PW so far out of reach that I could never touch it again. 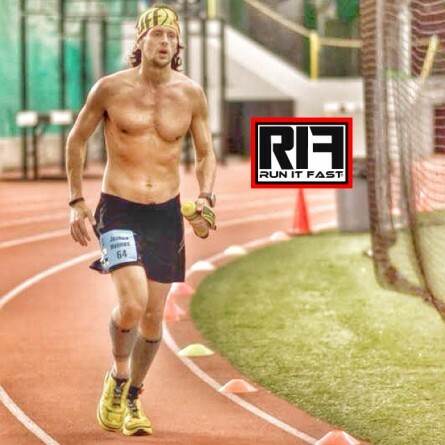 I was extremely elated upon hitting 100 miles because of the mental focus and push it required to get to that point. The miles were slow and painful after 100, but I continued to push through it. I made a deal with myself that if I made it to 110 miles before 1am that I’d go shower, lay down to sleep and not set an alarm. If I got up by 11am before the race was over I’d do more miles. If not I was content with what I had battled through to get to 110 miles in 38 hours. I slept for 5-6 hours, quickly dressed, put on my shoes, and was back on the track at 7:30am with about 3.5 hours of race time left. I walked several laps at a brisk pace to wake myself up and to see how my feet, ankle, and the rest of my body was feeling. 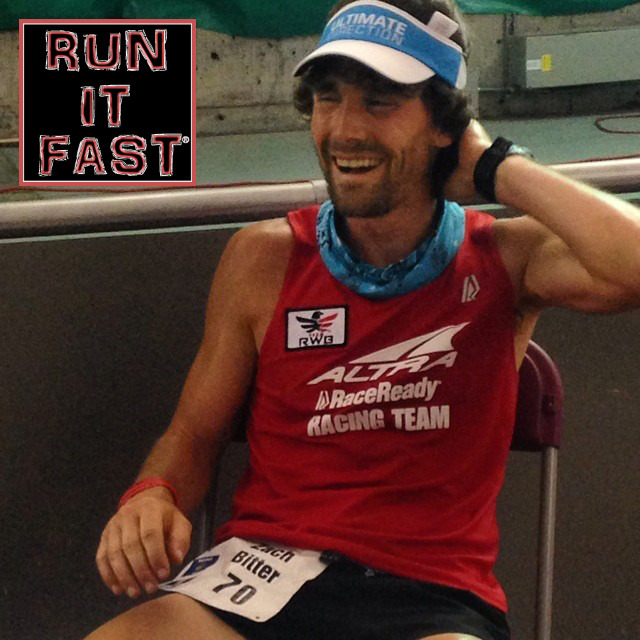 Once I felt like my body functioning at an operative level and well hydrated I started to feel the loud tick-tock of the race clock ticking down. I started chugging sweet tea and taking Gu Roctane again. I wanted to see how many more miles I could pour out of my body onto that concrete track before time expired. It was a point of the race where I could empty and dump all of my energy, and what remained in my body, to maximizing a strong effort until the end of the clock. My motor started revving high and my legs started kicking and throwing down the soles of my shoes off the track at a pace that would have made a half marathoner and most 10K’ers proud. My laps went from 4:20 to 3:30 to 2:45 to 2:15, all the way down to 1:42 and 1:43 (6:40 mile/pace). I ran the last 20-24 laps between 1:42-2:10 and was able to put down several extra miles with my increased turnover of the track. I ran a couple of 7’s, and several 7:30-8 min miles during this stretch to conclude the race. 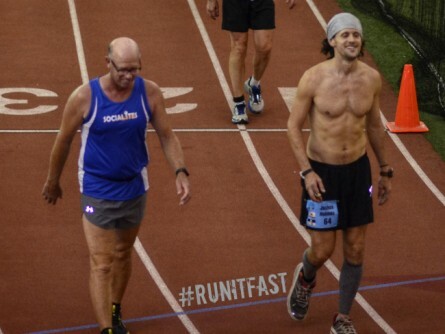 When I had started back at 110 miles, I had hoped to be able to get around the track enough to reach 120 miles. The clock stopped and the trackside television monitor had me at 500 laps and 128+ miles. For some reason that number evolved down to 127.47 miles within a few hours of the conclusion of the race. It was nothing that I was going to throw a frenzy over or complain about at that point. As poor as my race had gone, I was able to feel really good with the way I finished it. My quick explanation of my race is that I had a good four hours to start the race and a really great last two hours to conclude my 48 hour Six Days in the Dome…it was just that very poor and painful 42 hours in between those two strong stretches that had to be endured. The highlight of my race was watching my friend Traci Falbo set a World and American record for running 242.35 miles in the 48 hour race. It was an amazing spectacle to behold. It was also a visual spectacular to watch Zach Bitter run 100 miles in 12:08 which is the third fastest American time ever. 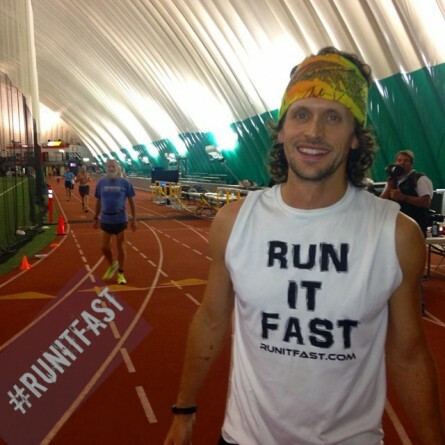 I also go to witness the first 60 hours of Joe Fejes’ U.S. record of 580.3 miles in six days. I was as equally impressed by power walking Run It Fast member Yolanda Holder who gracefully walked, at a very high speed, to 400 miles in six days. A few days later, at the conclusion of all of the Six Days in the Dome races, I found out I was the 1st overall male winner for the 48 hour race. The 48 hour field was small, especially on the male side. I ended up 4th overall behind three great female performances and a mere 400+ laps behind Traci. 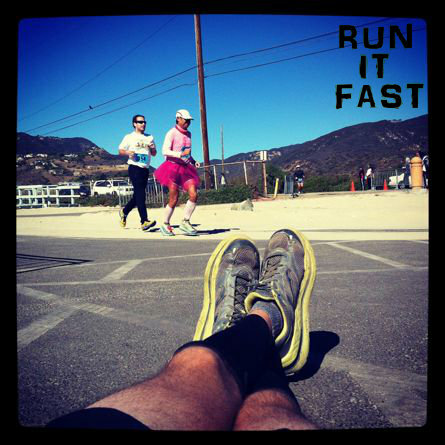 Malibu, California – MIM was my second marathon in my back to back marathon weekend. I was tired and my body was thrashed from the day before at the Catalina Eco Marathon (race report) where the big hills and drops had done a number on my legs. The progress my left knee, which had been recovering from a torn meniscus, took several backwards the day before on the island. 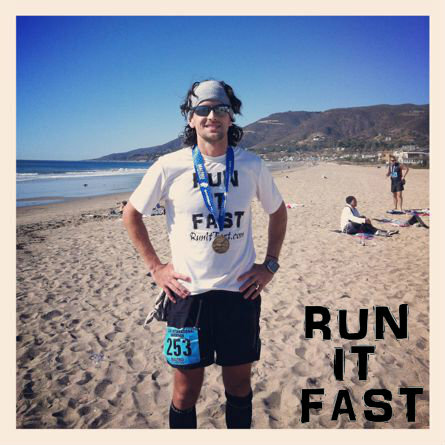 Run It Fast member Lisa Gonzales (RIF #5) picked me up early at my house to make the hourish drive over to Malibu where we parked near the finish line at Zuma Beach. From there you hop a bus for about an hour to where the race starts inland. Before the race I ran into Deo Jaravata, Nadia Ruiz Gonzales, and Yolanda Holder from the day before along with Maniac Rocky Morales and several other running friends. I hate to complain or knock marathons, and this will be my only complaint about the Malibu Marathon, but the race was supposed to start at 8am and we didn’t end up starting til 8:30am because the RD’s made everyone wait for someone to arrive at the starting line for the race. A delay of that length can throw off many runner’s nutrition, race plan, etc. This race is big enough that it should have started on time. Everyone shivered and waited hurdled together for the race to finally start and it finally did. 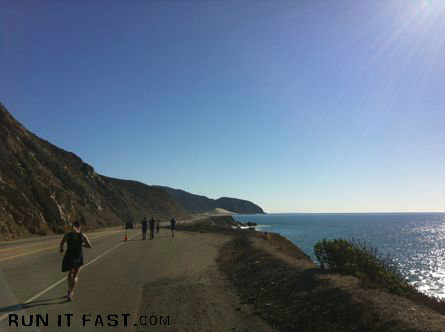 The first 10 miles take you from inland, through several turns around farmland, until you reach the Pacific Ocean at about mile 10. I struggled for those ten miles leading to up to the water. I was slugglish, tired, and my knee and feet were hurting from the day before at Catalina. But getting to where the water started was good mentally as nature’s beautiful scenery started to unfold in front of me with majestic mountains and hillside to my left and the endless ocean and beaches to my right. Somewhere around mile 15 a fellow runner pointed out dolphins jumping in the water to me. It was a truly wonderful site to witness during the middle of a marathon. I had good and bad stretches over the last 16 miles of this race. I became stronger on the uphills as there were several long uphills as the race got closer to the finish. I was able to keep running up them and past many other runners as they walked and fatigued. I’d then float and speed down the downhills and straightaways as I started to count all the targets I was knocking off. I met a sweet woman over the past 3 miles that pushed me as I pushed her as we were eager to get to the finish and put this one in our race journals. The medal was great and instead of a finisher’s tech tee like at most races they gave everyone a Malibu International Marathon beach towel which was a nice touch. The finish area had two food trucks and a live band as runners relaxed on the beach, in the water, and at the finish to watch the remaining runners came in. I waited for Lisa to come in (that’s Deo above not Lisa) and she did with a smile as she had hit her pre-race target. We ate some food from one of the food trucks and then made the trek back home. I’m thankful for Lisa picking me up and dropping me off for this race. It wasn’t necessary on her part, but it made it easier on me having run and traveled to Catalina to race the day before. A beautiful race in one of the most beautiful places in the United States.